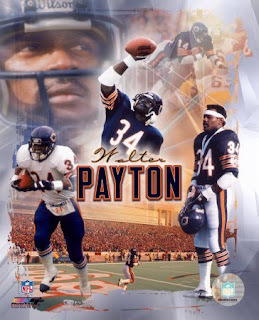 I miss Walter Payton. I miss having him part of Chicago. While he will always be here in spirit, his passion, empathy and compassion for people were well known here and for those things and more he will always be a cherished part of Chicago sports history. I still remember exactly where I was when I heard the tragic news of Walter's passing. As I was walking to a sales call in downtown Chicago with my headphones on, I stepped off a curb in complete shock and was tugged on the sleeve by a passerby avoiding a right turning cab. The strongest, fiercest competitor from that '85 Bears Super Bowl Championship team was the first to leave this earth, at far, far too young an age. Today is the 10 year anniversary of his passing. Enjoy this glimpse at the greatest ever. Nice tribute to a great player and a great person. The video was cool, too. I sure wish the Bears had a runner like Payton today. If you haven't seen it, track down a copy of of an NFL film called, Pure Payton. It gives me chills being able to see him run again.